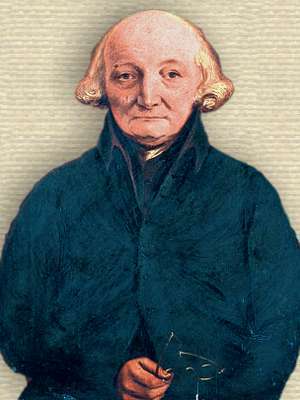 Swiss-English geologist and meteorologist who was influential on 19th-century writing about meteorology. He believed in catastrophism as the explanation of current geological formations. I am here tracing the History of the Earth itself, from its own Monuments. 'Geological Letters Addressed to Professor Blumenbach, Letter 3', The British Critic, 1794, 598. It will be contributing to bring forward the moment in which, seeing clearer into the nature of things, and having learnt to distinguish real knowledge from what has only the appearance of it, we shall be led to seek for exactness in every thing. 'An Essay on Pyrometry and Areometry, and on Physical Measures in General', Philosophical Transactions, 1778, 68, 493. 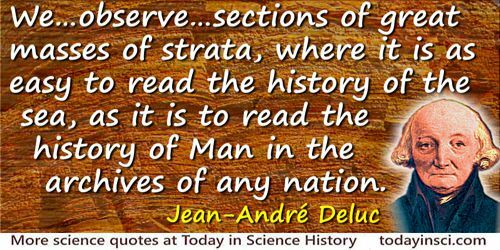 8 Feb - short biography, births, deaths and events on date of Deluc's birth.